It’s Monday! What Are You Reading? That’s a question I did not get to ask last week so I didn’t want to miss the chance to play along this week. This link up was started by Sheila at Book Journey and it’s fun to play along. I love to see what everyone else is reading! I’m on vacation in Florida and vacation is a funny thing. I either read ALL the time or I get caught up in other things and don’t seem to have the time. Then I’m too tired at night to even read in bed. So far this vacation has been the second kind. Not having much time to read during the day. My other issue is that I’m using my Nook for the first time and it’s taking a while to get used to it. 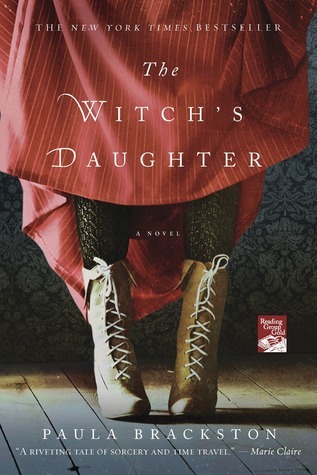 The Witch’s Daughter by Paula Brackston. It was a book I got on one of the specials that Nook offers, I think I paid $1.99 for it, good deal. I’m enjoying the book so far. The book is partially set in the 1600’s. One of the best parts of using the Nook, when I come upon a word from the 1600’s that I don’t know, I touch the word and I can look it up! Very handy and helpful, since I didn’t bring a dictionary with me! 😉 We went to the beach the other day to read and I must admit it’s a little tricky to read the Nook in the sun, but I can work with it. I have been picking up some treasures in the way of books during my trip so far, but I’ll save those for when I post an update on The Great Thrift Store Tour. That’s it for me for It’s Monday! What Are You Reading? Be sure to stop by at Book Journey to check out the other blogs that are linked up. Happy Monday! What ARE you reading?! This entry was posted in Uncategorized and tagged books, It's Monday! What Are You Reading?. Bookmark the permalink. ah, reading on the beach, now that does sound like fun!! sounds like you are busy and enjoying the vacation, fran! i usually have good intentions to do lots of reading…and fall quite short! i’ll read for a bit on the beach, but beach walking and people watching then take over! that is a neat feature of your nook, to look up words – very cool! There are a LOT of distractions here, Cathy! I love walking on the beach and looking at people too. Have a great day! I’m in Clearwater, Bett. It’s a really pretty area. Gail has said this is an unusually warm winter which is ok with me. Hugs to you too, Sweetie! So Lucky!!! I’ve seen The Witch’s Daughter around. It has such a beautiful cover 😀 Happy Reading! Hi Adrianna! Thanks for visiting. I love visiting down here. The book is iteresting so far! Beach reading is the best! I love the cover art on The Witch’s Daughter. Enjoy your trip! Hi Rebecca! I was drawn in by the cover also! Oh my I would love to be reading on the beach right now. Have fun! Hi Shandy, thanks for visiting! Love to read near the water! First time popping over from the book journey, hope you enjoy your holiday and what an interesting book, must look it up. Hi Ruth, glad you stopped by! The book is pretty interesting so far! It’s been tricky for me here, Laura. Partially because of getting used to the Nook, but I’ve gotten 10 books since I’ve been here. My friend is going to charge me shipping charges when she brings the stuff home for me!! Hope you’re having a lovely holiday – and that you’re getting some sun! That book looks good, might have to have a look for that… I’ve just finished The Slap, about a man who hits a child at a family barbecue, and although it was really gripping, I wasn’t convinced by the end – it seemed not to finish the story! I’m still reading the third book in The Game of Thrones series, but something just happened that almost made me fall out of my chair. It was a holy crap moment. Love books that do that. I hope you’re having a great vacation Fran. Try to soak up as much sunshine as possible. That’s a nifty tool on the Nook. Didn’t get a chance to read this last week, but I’m looking forward to some book time this week! I like that feature a lot, Katy. Hope you get some reading in! That’s great, Allie. I use dictionary.com when I’m on line, but I have a dictionary next to my exercise bike to look things up when I’m reading!